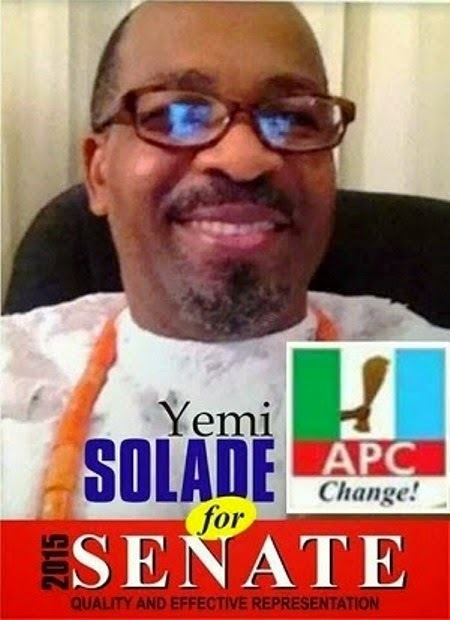 Home Nollywood #News: Popular Nollywood Actor,Yemi Solade To Contest For Senate In Ondo State? #News: Popular Nollywood Actor,Yemi Solade To Contest For Senate In Ondo State? Nollywood actor, Yemi Solade, who is currently the interim chairman of the newly floated TAMPAN. Friends and fans of the actor flooded social media recently with posters of him who has reportedly disclosed that he is seeking an elective into the Senate on the platform of the All Progressives Congress (APC). showbiz stars who have made their intentions known to contest in 2015. As an actor, Yemi has featured in several blockbuster movies especially in the Yoruba section of Nollywood as well as a number of TV soap operas.